In an effort to infuse a bit of extra “fun” into the season a number of years ago we came up with a few competitions (of a friendly nature) to inspire our guests to rise to the top, swing for the fence, don’t pee into the wind, etc. 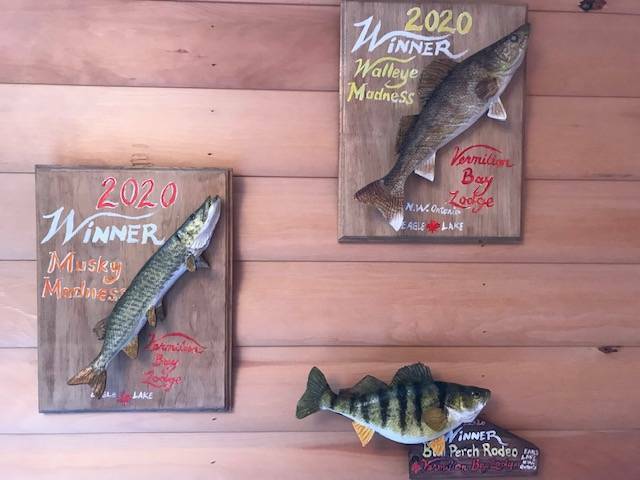 Who would have thought that in 2019 we would be coming into our 15th Musky Madness Week or our 14th Walleye Madness Week! 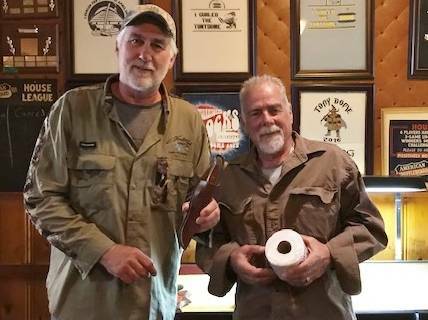 That’s a fairly distinguished alumni of trophy winners over the years…..including Jeremy Wade from River Monsters who took the Musky trophy several years back. 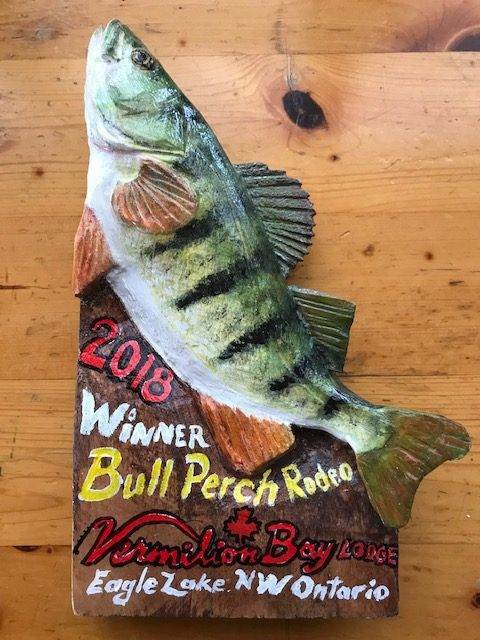 Add to the excitement the relatively young Bull Perch Rodeo contest with it’s nail biting season long climax…a veritable hunt for the “big one”. You might be thinking right about now that it’s almost too much to comprehend. Well let’s simplify it by talking about this year’s competitions, the winners, and the losers…. 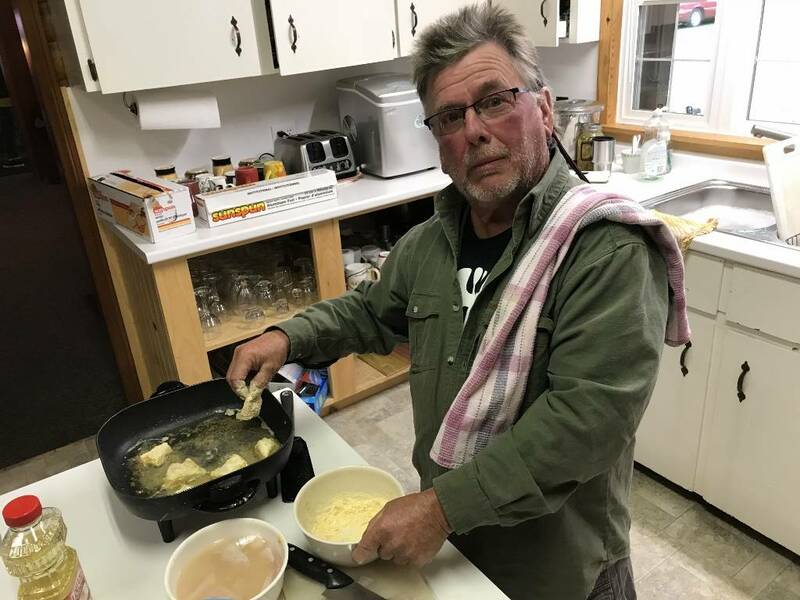 Let’s examine Walleye Madness Week. 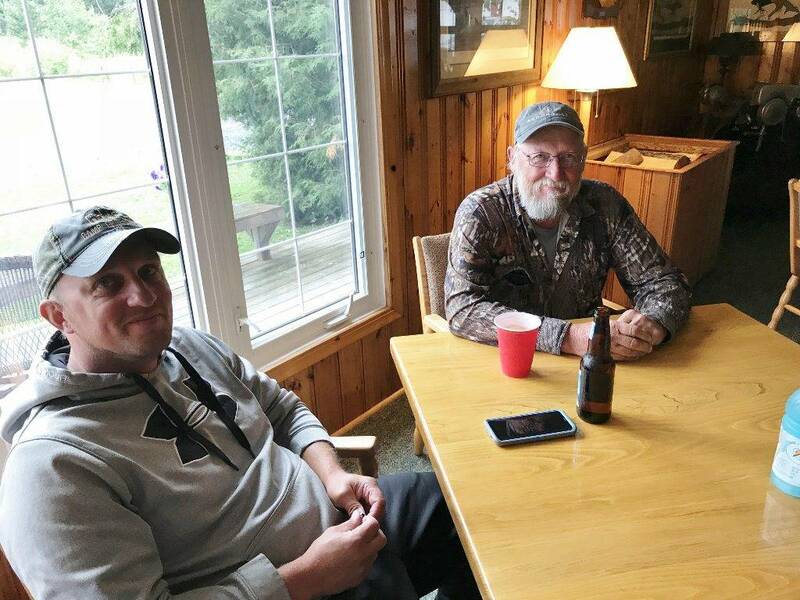 The last week of July brings together a seasoned bunch of walleye anglers. 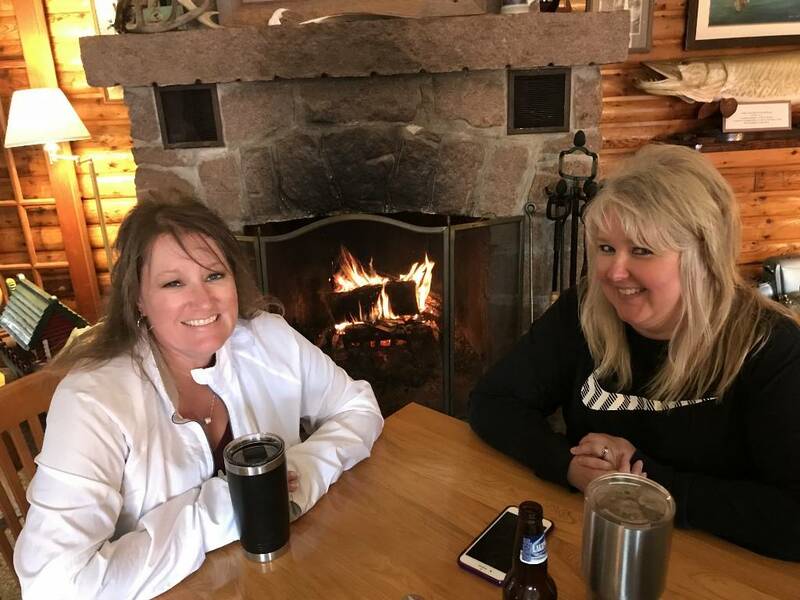 Meanwhile the ladies take in the fire and flagons of home brew. Sorry, you can’t hide the cocktails…the eyes tell all. Guilty! Meanwhile, back in the kitchen Ric puts the finishing touches to his special fish dish while contemplating his speech, should he win. Oh, no, it was not to be. A good effort and a runner up prize (fabulous VBL bling). Sadly though, the loss was hard on Ric…seen here somewhat shrunken in his defeat. 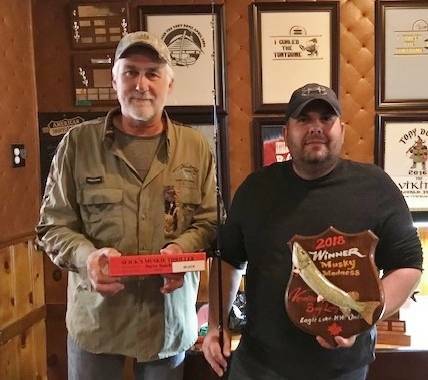 While he did take 3rd place it was enhanced by the fact he beat his boat partner Brad Walker. 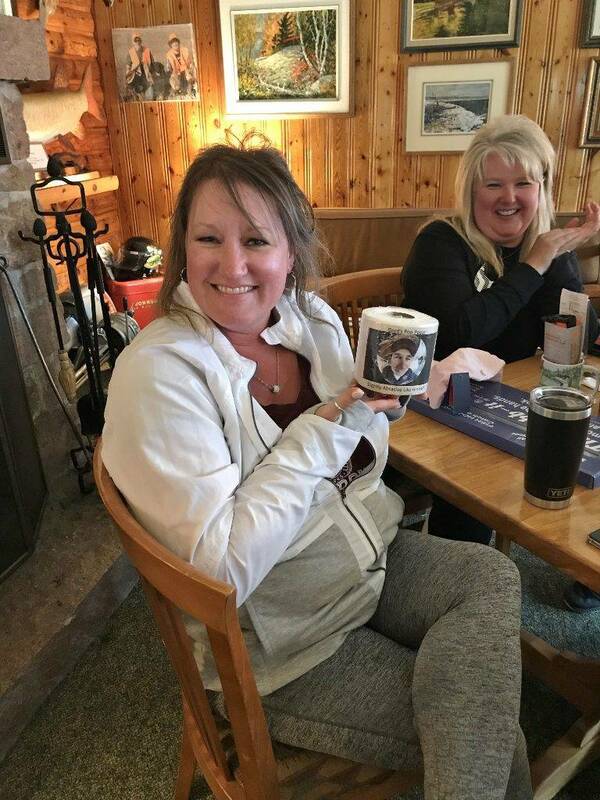 Not sure where these two seasoned veterans placed but obviously they are relieved to have won mugs rather than toilet paper! Bringing home the bacon. 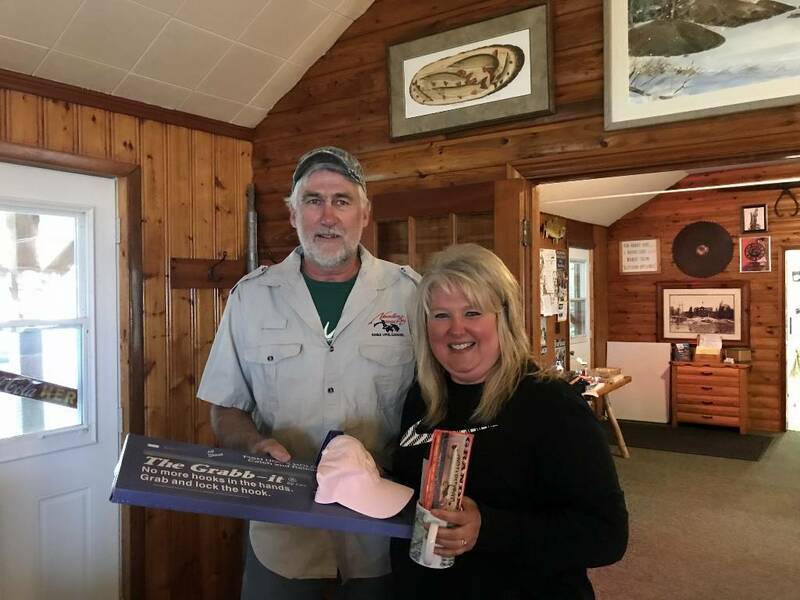 Way to go Jen for releasing a 36 inch northern! 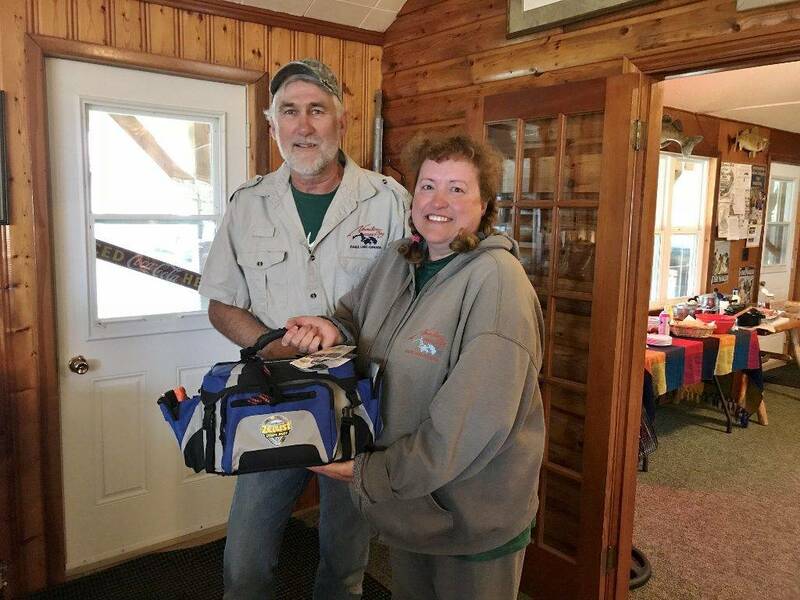 Second place winner Marcie Carey is ecstatic with what she incorrectly thinks is a new purse. 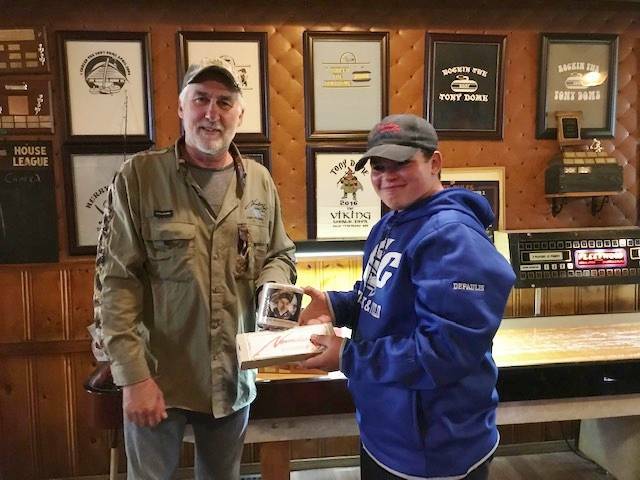 The winner of the 2018 Walleye Madness, Scott “the weasel” Wesling taking home a carved wall plaque and assorted walleye gear. Congratulations! Pro tip: Scott is returning in 2019 to defend his title. His weakness’s include: early mornings, patience, Old Milwaukee beer and soft puppies. Plan your strategy carefully if you wish to take on “The Weasel” in 2019! …as a reminder and source of constant aggravation to those who really, really want to win this award. You know who you are! 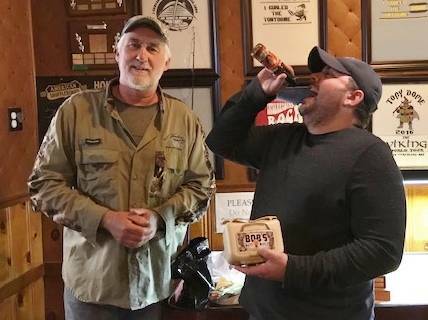 This year we have the unusual conclusion of a father / son duo who tied as winners of the competition. At 11 1/2 inches we congratulate Truman Wilson and son Zachary for taking the title. The plaque has been sent for their mutual enjoyment. As I write this I can feel the tension building for next year. Andy Lewis? Paul Fulka? Kurt Hebecker? Truman Wilson? New guest? This leaves our final competition, Musky Madness. 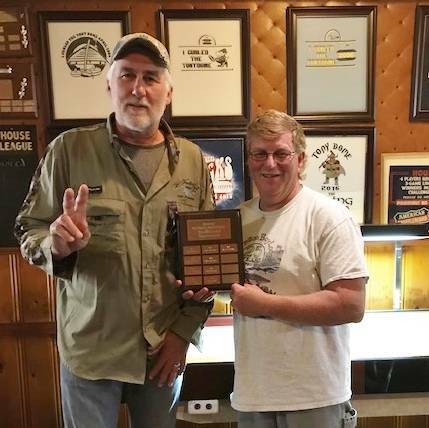 Held the last week of September (generally our last week of the season), it is the longest musky of the tournament that takes home the prize. 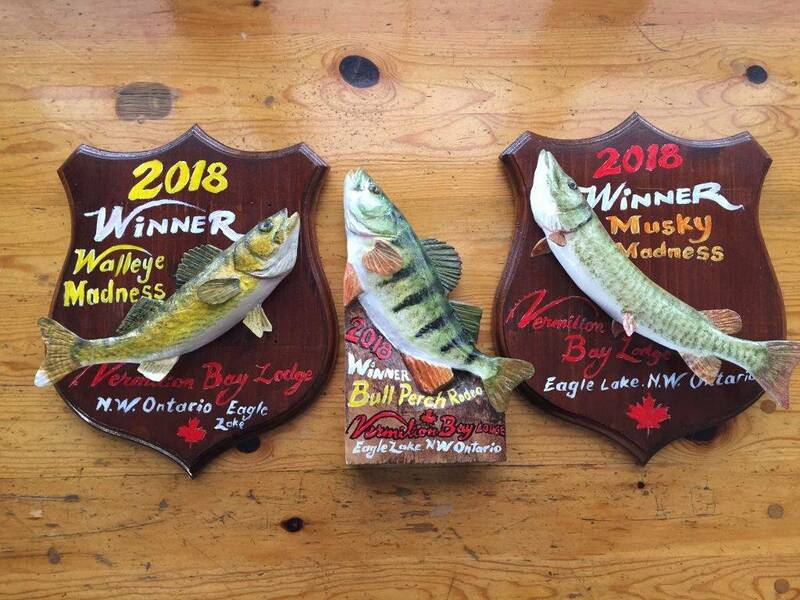 The culmination is our awards night / banquet / shuffleboard tournament that is hosted by the Bayview Hotel (Official watering hole of the VBL Musky Madness Week). On a side note I have exhausted my supply of limited edition toilet paper. This will likely be seen as a good thing. 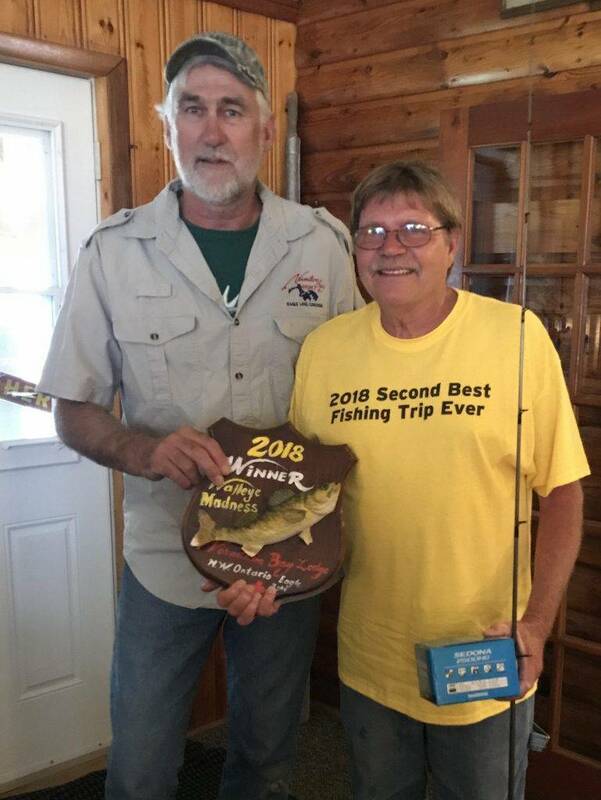 The above photo shows Bob, who placed first and second with his 46″ and 38″ muskies. Congratulations on a job well done! 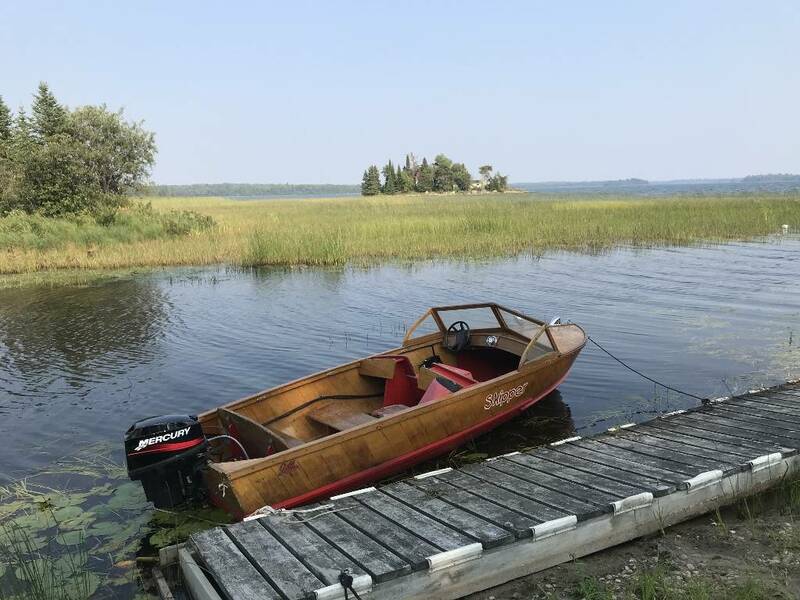 Stay tuned for our next report on some late fall fishing and what’s been happening around camp. Renovations? Docks? Boats? Bob Izumi? Once you have gotten your name on the trophy, the novelty is lost. 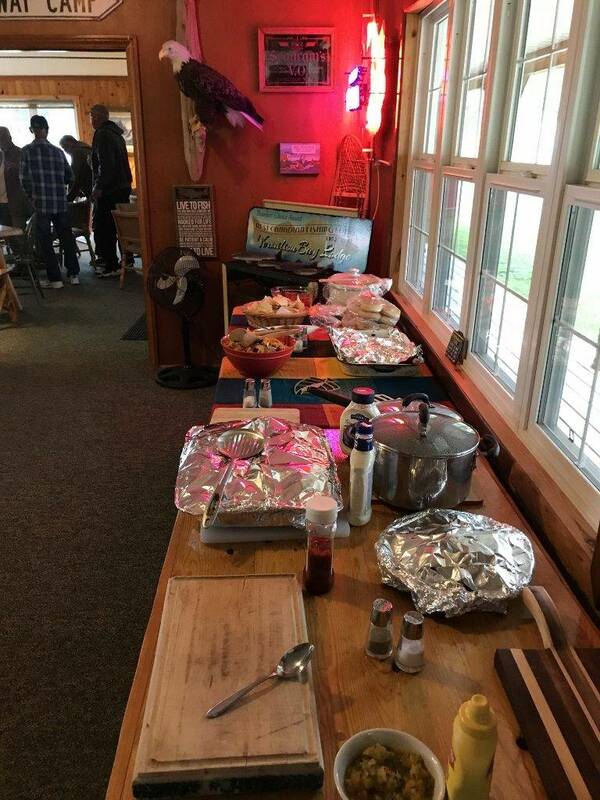 Gord, are there any guests who have marked their territory on all the trophies? 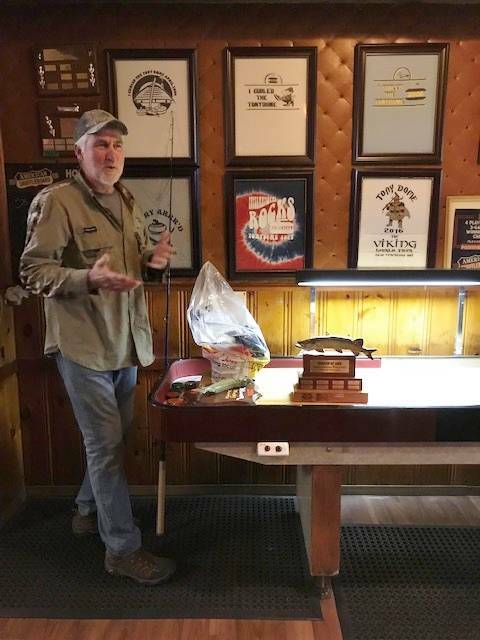 If you must, go ahead and include the shuffleboard tourney. 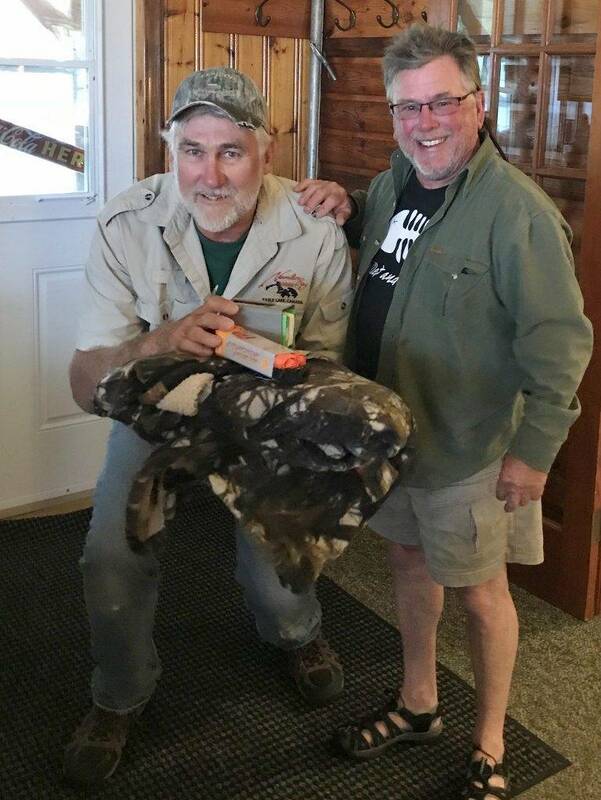 Will this year include a pike, whitefish, trout or bass trophy? Andy, you may have the title of being on all the trophies. Sadly you missed the challenge of regaining perch superiority last year. 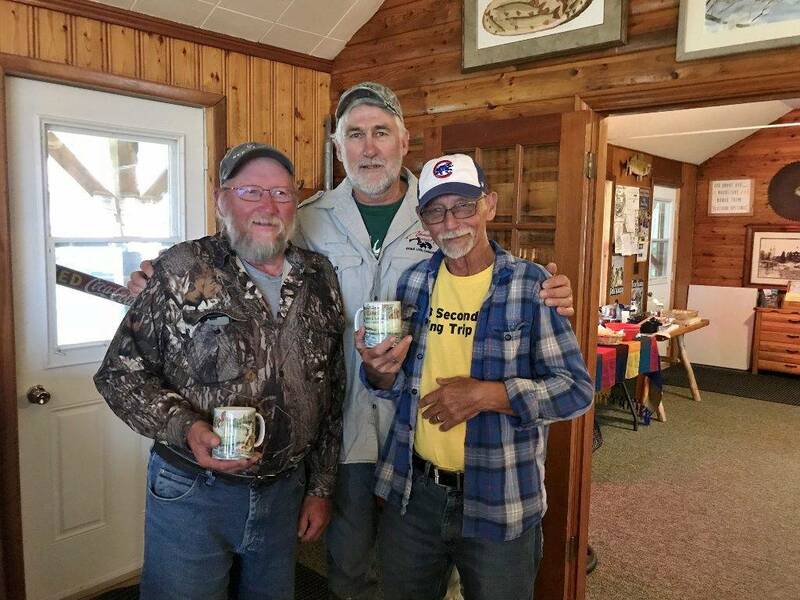 Looks like the usual excellent fishing and good times! 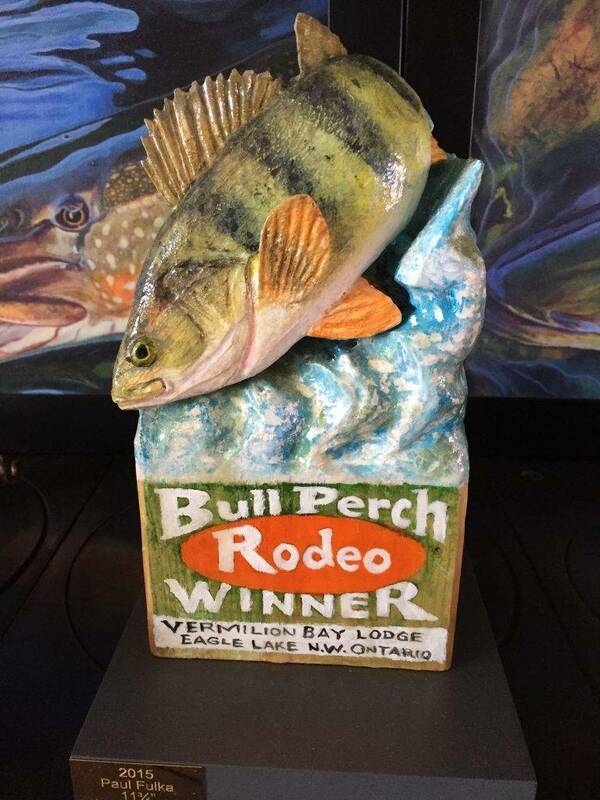 Wonderful wood carved fishing trophies, life likeep in everyway. Very true Charles. I’ve gone back into the post and added a link to your website should others like their own fish art. Apparently I make quite an impression. I need to come up for Musky Madness and show you how it’s done. Did I hear 40% off your fourth week? Well, 30% of discount from the current exchange rate, plus 10% for a repeat trip, so yes that seems like 40%! Congratulations to Truman and Zach for their bull perch win. 11 1/2” is a bit on the small side but a “win is win”. No tension building up on my part. 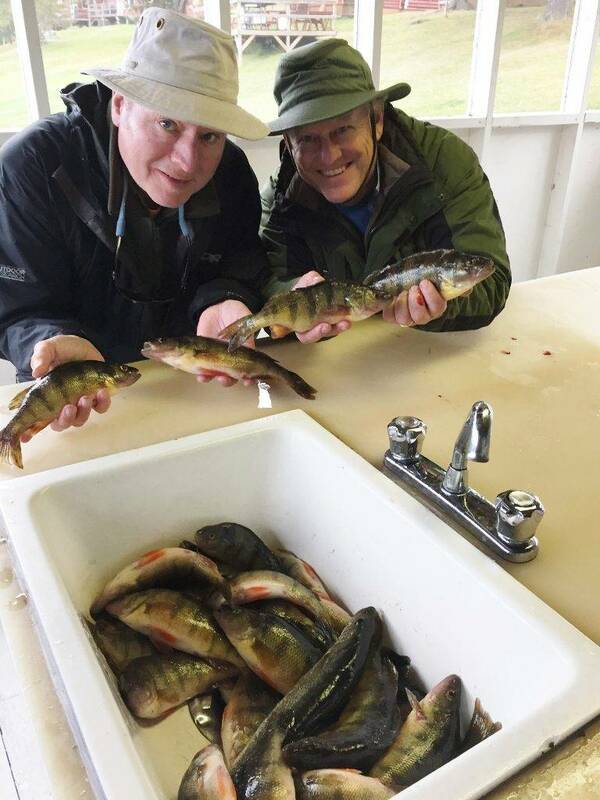 My biggest enjoyment is limiting out on perch with my fishing buddy George and watching Gord cleaning 100 perch. Catching the largest perch is nice but secondary to keeping Gord busy. I was not able to get up to Canada in 2018 but might try to get up there next year.